Did you know that empty cans contain 80% air? If not crushed this causes overflowing skips and carts which leads to frequent and costly refuse collection. The KK Manual Can Press can reduce and flatten a 5 litre can’s volume from 5:1, allowing 5 times as much waste to be taken away in one load. this signifcantly reduces collection frequency – which is a huge saving. 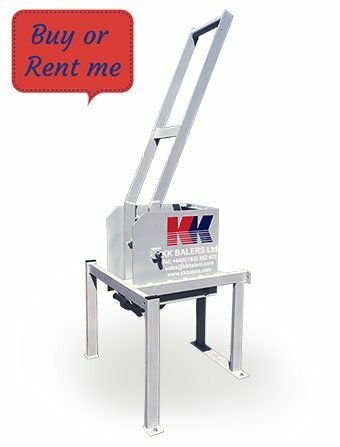 The KK Manual Can Press can be purchased or rented as a complete unit or as two seperate items, the first being the can press itself and secondly the galvanised box underneath. The benefits for purchasing the unit seperately is that many companies opt to use their own collection trays or boxes. 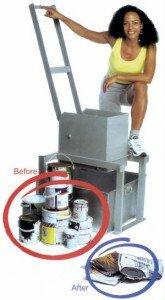 The can press would suit any size company from building contractors, painters and decorators to small restaurants and hotels. Any place that uses cans and therefore need to dispose of them, would benefit from the can press.